Posted: July 11, 2017 in Call to Action, Fight war and war mongers, For your information, resistance, Saying it like it should be said. 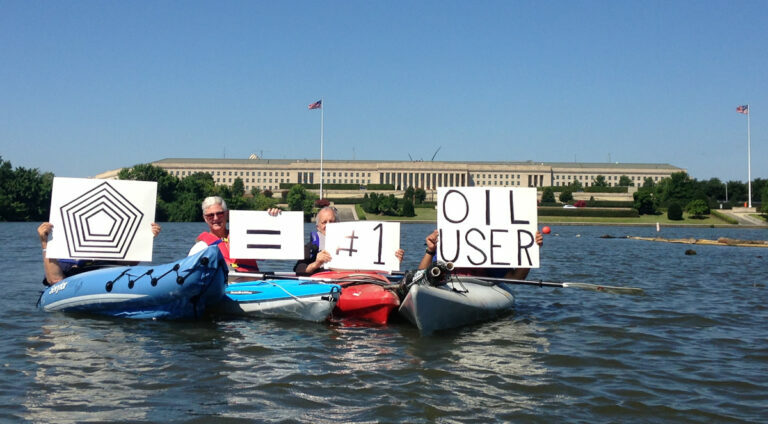 One week before the #NoWar2017: War and the Environment conference, World Beyond War will work with the Backbone Campaign and other allies to organize a flotilla for the environment and peace, bringing kayaktivism to Washington, D.C. Pentagon war making is a leading cause of world-wide environmental degradation. Did you know that the U.S. military is the top consumer of petroleum around and would rank high by that measure in a list of countries, were it a country? Did you know that 69% of EPA Superfund environmental disaster sites were created by the military, or that the military is the third worst polluter of U.S. waterways, or that the United States could convert to entirely sustainable energy for a fraction of the U.S. military budget (and earn it all back in healthcare savings)? While militarism is a top cause of climate change, control of fossil fuels is a top motivation for wars. Wars are not “caused by” climate change in the absence of any human decisions to go to war, but people who choose war often do so in response to the sorts of crises that environmental destruction is creating. Learn more here or at our conference. Pro-environment and pro-peace activists are learning to work together. This is an exciting time! Join our flotilla: click here! When you sign up for the flotilla, you’ll indicate how many people you are bringing, whether you are bringing any boats, whether you want training, etc. We will be renting kayaks for those who need them. We will be paying $5 to the marina for each boat or kayak we launch. We will be making signs. We will be bringing people to D.C. from the West Coast. We will be providing free trainings. To help us with costs, please donate what you can when you click here to join the flotilla.